The world's forests are in crisis. Almost half of the Earth's original forests have been destroyed and of what remains, only a tiny fraction is adequately protected. Worldwide, some 26 hectares of forests (the equivalent of 37 football fields) are being lost every minute. Worldwide demand for paper has increased fivefold since the 1950s, and it is expected to double again over the next 50 years. For millions of years, the high peaks and deep valleys of China's forests have promoted speciation and provided refuge during ice ages, and as a result, are the most biologically diverse temperate forests on earth. China's forests harbor over 2800 tree species and multitudes of other plants, and are also home to numerous rare and threatened animals such as the giant panda, golden monkey, snow leopard, and crested ibis. Forested uplands protect China's lowland river valleys by storing rainfall and gradually releasing it so as to reduce the severity of droughts and floods, preventing soils from eroding, and making possible the country's intensive irrigated agriculture system. Forests also provide 40% of the fuel for rural households. For these reasons, China has been called one of the most forest-dependent civilizations in the world. In 1999, WWF, in conjunction with the State Forest Administration helped introduce the concept of timber certification into China by co-sponsoring the first conference on certification ever held in the country. 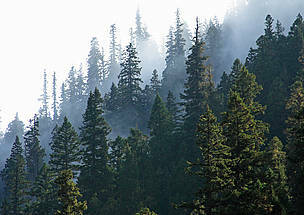 A National Working Group on Forest Certification in China was established in May 2001. China now has 1.4 million ha forests certified by The Forest Stewardship Council (FSC). In addition, over 1000 timber companies have been certified for chain-of-custody (CoC, process that, using independent auditing, rigorously documents certified timber from the forest to the final point of purchase.) under the FSC scheme. A FSC China Standard is currently being drafted. Since 2001, WWF China has been working to establish new reserves in the forests and wetlands of Northeastern China. With the support of WWF China, 24 new protected areas in Heilongjiang province in northeast China, totaling 1.8 million hectares, were created between 2002 and 2005. The government will add another 1 million hectares by 2010, bringing the province's total protected area cover to 6.4 million hectares, occupying 14% of the total territory of Heilongjiang province. Major forest management units in the tiger habitats in Changbaishan and Wandashan regions have conducted high conservation forest identification and nearly 1 million ha of forests in the two regions have passed FSC certification auditing. WWF China is seeking collaboration with WWF Russian Far East to harmonize the forest management on both sides of the border in order to secure abundant land for tigers. WWF supported a landscape approach that helped local government and communities balance the different demands they place on forest resources. The experience and knowledge gained from this project is currently being used to develop a larger scale forest. Since 1998, China has stopped commercial logging of its natural forest in 17 provinces. However, China is now the world's second largest wood importer (after the US), with nearly 15 million cubic meters of timber imported in 2000 (as compared to about 4 million cubic meters before the ban), and is hastening the destruction of South-east Asian and Siberian forests.